Today I am going to talk about the centralized Management systems for Palo-Alto Firewalls named as Panorama. Panorama is used to manage the Next Generation Palo Alto Firewalls and is very much accepted by Enterprise customers. It delivers a single location from which we can supervise all applications, users, and content negotiating your network, and then use this information to generate policies that defend and control the network. Consuming Panorama for centralized policy and firewall management surges working effectiveness in managing and preserving a dispersed firewall network. Palo Alto’s Panorama is accessible both as a dedicated hardware platform or as a VMware virtual appliance which is running on an ESXi server basically. 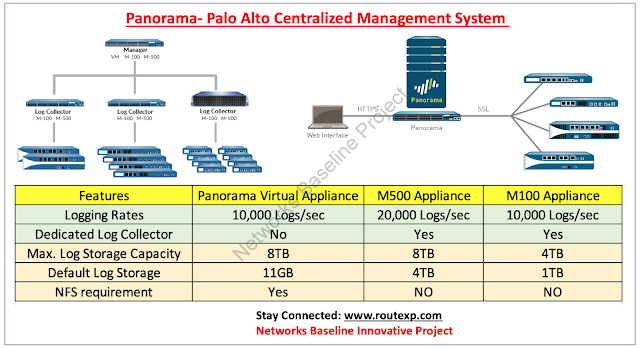 Here in this article, we are going to install and configure Palo Alto’s Panorama on virtual appliance. First of all, you need to download the Panorama base image OVA file. OVA define ad Open virtual appliance. Once you downloaded the OVA file, then you have to launch the VMware vSphere client and connect to VMware server. Now select File and deploy OVF template. Now browse the Panorama OVA file and select, after selection click next. You can opt for the desired name of the Panorama Virtual appliance. Now go and select the datastore Location on which to install the Panorama image and click Next. Indicate which networks in the inventory to use for the Panorama virtual appliance and Confirm the selected options and click Finish to start the installation process. When the installation finishes, right-click the Panorama virtual appliance and Edit Settings to default which says it requires 4 GB memory for 1-10 Firewalls, 8GB for 11-50 Firewalls and 16GB for 51 till 1000 firewalls. Select you option on the basis of the firewalls in your network and the number of the firewalls you are going to manage through Panorama. Set the SCSI Controller to LSI Logic Parallel and click ok to save the changes. Now In the vSphere Client, right-click the Panorama virtual appliance and select Power on.When the Panorama virtual appliance boots, the installation process is complete. Roughly 11GB of the partition is allocated to store the logs collected from firewalls and the logs that Panorama and Log Collectors create.Earlier ESXi versions support a virtual disk of up to 2TB. If you need more than 8TB, you can mount Panorama to an NFS datastore but only on the ESXi server.The Panorama virtual appliance works finest in situations with logging rates of up to 10,000 logs per second. Panorama mode: The appliance accomplishes both central management and log collection. This is the default mode. Log Collector mode: The appliance utilities as a Dedicated Log Collector. If numerous firewalls advancing large volumes of log data, the M-Series appliance in Log Collector mode delivers improved scale and functioning. In this mode, the appliance has no web interface for administrative access, only a command line interface (CLI).